Let’s start with the outside of this book — the cover is enticing and the title is subtle and wonderfully descriptive. The whole package makes you wonder what is inside. The book is written in five sections spanning several decades from the late twentieth century to the mid-twenty-first century. Each section is written from the point of view of different characters. The story begins with teenaged Holly Sykes, the protagonist of the novel, finding her boyfriend in bed with her best friend. Holly makes an appearance in each section in the middle of the book with the last section also told from her point of view. David Mitchell is a superb storyteller and can take the reader to the scene like no other writer. This is especially exciting and interesting for the reader when Mitchell invents a post-apocalytic world as in the final section of The Bone Clocks or in Cloud Atlas or when Mitchell invents a place that exists only in his imagination and then takes the reader there. His descriptions are vivid and detailed. The Bone Clocks is not my favorite Mitchell novel. That position is still held by Cloud Atlas. Although The Bone Clocks is probably the best book I’ve read thus far in 2014, The Thousand Autumns of Jacob de Zoet and The Bone Clocks are tied for second place in my personal ranking of David Mitchell novels. 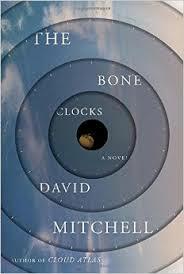 My only gripe about The Bone Clocks is Mitchell’s propensity for sharing his personal viewpoints through his novel. (Note: Mitchell was named one of the 100 most influential people in the world by TIME magazine in 2007.) For example, the reader can surely glean his feelings about religion from the last section. Or can they? Does Holly consider the horologists gods when she says a prayer asking for salvation for her two charges? Is her prayer answered? You can decide when you read The Bone Clocks. It is worth your time and your effort at over 600 pages. Book Details: Published by Random House (September 4, 2014), 640 pages.